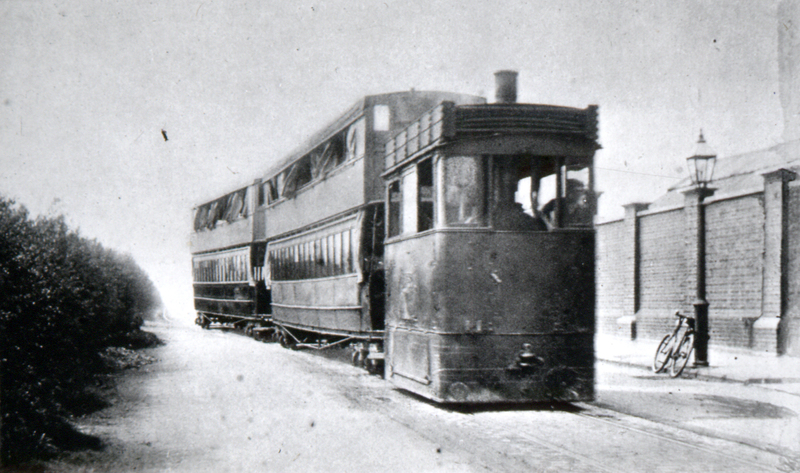 The Wolverton to Stony Stratford tramway was opened in 1887. The service was extended to run as far as the village of Deanshanger in 1888, but this part of the service was withdrawn within two years as it proved uneconomic to operate. The tracks remained for years afterwards. For almost 40 years Stony Stratford had a tramcar service with the largest tramcars ever to run through the streets of a British town. 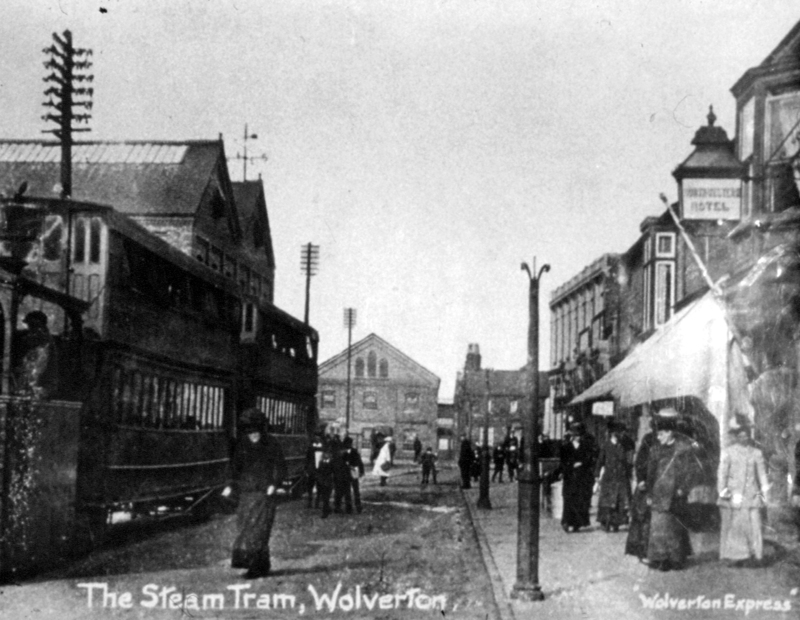 Below is an extract from an interview with a Stony Stratford resident of his recollection of the tram service between Stony Stratford and Wolverton. The tram depot was in the road where we’re living. The tram was drawn by steam engines. The LMS took over the tram company when it was going bust after the First World War and the employees became LMS men and went on strike in May 1926. The tram stopped and never ran again. There used to be a stop at King St, then it didn’t stop again until it got to the Print Works – only when it couldn’t get up the hill, when we had to get out and push: Snow or anything on the line would stop it. The road in those days was twisty and turning to Wolverton and it was only when they took the metals up that they straightened it. Where the road turns to Old Wolverton there was a sharp hill and when they did the road they levelled it off. But in those days when the tram was running it was quite a sharp incline. If the tram hadn’t got enough steam he’d go bop, bop, bop and it would run back. We’d have to get out and then push it back over the top of the hill, then get back in and away we’d go again. If it was a wet morning the driver would run it back nearly to the Mill drive, get up steam and then go again, hoping he’d get over. Sometimes it would come off the rails and they’d just back it on till it dropped on the metals and away it goes again. Some men could afford bikes but most never got enough money to buy them. A bike cost pounds – the cheapest bike after the First World War was £2 or £3 which was more than a week’s wages. The first car I remeber in Stony Stratford was Col. Bull’s and his was the first registration in Buckinghamshire BH43. He had a chauffeur and they used to sit up there, 4 seats, 1 for the doctor and 2 at the back, no cover, just an open carriage and wheel was big and the driver used to sit up straight and drive it. It wouldn’t do above 15 to 20 mph. This was just before the First World War. After the War, Morris of Oxford and Austin of Birmingham started and they became more popular. This entry was posted in Heritage, People, Wolverton, Wolverton Works. Bookmark the permalink.